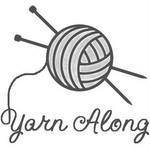 Wednesday Yarn Along: Scissors are my friend. and, cowls are more fun than washcloths. The new phonebook (I mean, knitting magazine) is here!